Progressive Field is the site of the matchup between the Kansas City Royals and the Cleveland Indians on Friday, September 15, 2017. The probable starting pitchers are Jason Vargas for the Royals and Trevor Bauer for the Indians. Kansas City opens at +215 while Cleveland opens at -234. The Royals have a 69-70-6 over/under record and a 68-77-0 run line mark. The Indians are 74-72-0 against the run line and have a 55-81-10 over/under record. The Royals have a 72-73 overall record this season. Starting pitcher Jason Vargas has a 15-10 record with an earned run average of 4.15 and a WHIP of 1.33. He has 116 strikeouts over his 158.1 innings pitched and he's given up 163 hits. He allows 9.3 hits per 9 innings and he has a FIP of 4.64. The bullpen has an earned run average of 4.32 and they have given up 501 base hits on the year. Teams are hitting .252 against the bullpen and they've struck out 456 hitters and walked 218 batters. As a team, Kansas City allows 9.3 hits per nine innings while striking out 7.6 batters per nine innings. They are 19th in the league in team earned run average at 4.63. The Royals pitchers collectively have given up 1,323 base hits and 659 earned runs. They have allowed 179 home runs this season, ranking them 15th in the league. Kansas City as a pitching staff has walked 460 batters and struck out 1,087. They have walked 3.2 men per 9 innings while striking out 7.6 per 9. They have a team WHIP of 1.39 and their FIP as a unit is 4.45. As a team Kansas City is hitting .260, good for 11th in the league. The Royals hold a .422 team slugging percentage and an on-base percentage of .312, which is good for 28th in baseball. They rank 11th in MLB with 8.9 hits per game. Eric Hosmer is hitting .328 with an on-base percentage of .394. He has 177 hits this season in 540 at bats with 85 runs batted in. He has a slugging percentage of .517 and an OPS+ of 138. Lorenzo Cain is hitting .300 this year and he has an on-base percentage of .361. He has totaled 158 hits and he has driven in 47 men in 527 at bats. His OPS+ is 112 while his slugging percentage is at .446. The Royals have 1,281 hits, including 230 doubles and 175 home runs. Kansas City has walked 349 times so far this season and they have struck out 1,036 times as a unit. They have left 897 men on base and have a team OPS of .734. They score 4.4 runs per contest and have scored a total of 633 runs this year. Cleveland has a 90-56 overall mark this year. With an earned run average of 4.33, Trevor Bauer has a 16-8 record and a 1.39 WHIP. He has 177 strikeouts over the 158 innings he's pitched. He's also given up 163 hits. He allows 9.3 hits per nine innings and his FIP stands at 3.88. The bullpen has an earned run average of 2.80 and they have given up 363 base hits on the year. Teams are hitting .222 against the Indians bullpen. Their relievers have struck out 484 batters and walked 135 opposing hitters. As a team, Cleveland allows 7.9 hits per nine innings while striking out 10 batters per nine innings. They are 1st in the league in team earned run average at 3.38. The Indians pitchers as a team have surrendered 1,130 base knocks and 484 earned runs this season. They have given up 149 home runs this year, which ranks 30th in Major League Baseball. Cleveland as a staff has walked 373 hitters and struck out 1,437 batters. They give up a walk 2.6 times per 9 innings while they strike out 10 per 9. Their team WHIP is 1.17 while their FIP as a staff is 3.39. As a team, they are batting .263, good for 6th in the league. The Indians hold a .450 team slugging percentage and an on-base percentage of .340, which is good for 2nd in baseball. They rank 9th in MLB with 9.0 hits per contest. Edwin Encarnacion comes into this matchup batting .252 with an OBP of .375. He has 126 hits this year along with 88 RBI in 500 AB's. He maintains a slugging percentage of .494 with an OPS+ of 123. Francisco Lindor is hitting .276 this season and he has an OBP of .336. He has collected 161 hits in 584 at bats while driving in 78 runs. He has an OPS+ of 114 and a slugging percentage of .505. The Indians as a unit have 1,302 base hits, including 296 doubles and 191 homers. Cleveland has walked 550 times this year and they have struck out on 1,044 occasions. They have had 1,045 men left on base and have an OPS of .790. They have scored 5.07 runs per game and totaled 735 runs this season. 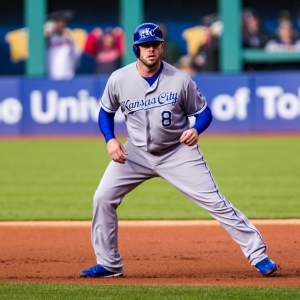 Who will win tonight's Royals/Indians MLB game against the spread?